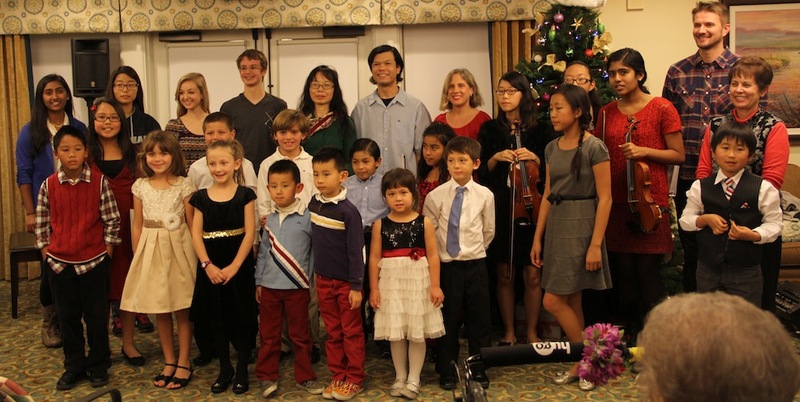 Friday evening December 20th, 2013 the SCV Branch Music Student Service League, MSSL, gave a recital at SummerHill Villa Seniors Home in Santa Clarita. Lots of fun and enjoyment was had by all! The success of this concert was largely due to excellent Teacher participation; around ten MTAC SCV Branch teachers enrolled some of their students, including myself, John Fairbanks, Madeline Miller, Hyun Chung, Elena Chao, Manak Khamvongsa, Patreece Jamgochian, Agnes Kim, Rosalina Sackstein and Joni Frey. Also, the event was very special and festive because there was a variety of instruments students performed on, such as the piano, violin, guitar, and flute. A piano duet, violin duet, and guitar duet, as well as flute with piano accompaniment and violin with piano accompaniment and many piano solo performances made the concert very entertaining. Twenty-two students participated as well as four Teachers who provided piano or guitar accompaniment to select students. A big thank you to Sabeena Sebastian, the student President of the SCV Branch MSSL, for being the em-cee and to the other SCV Branch MSSL students who performed or who were there to help sign-in and organize students. And thank you again to all of the Teachers and students who came out to participate.